What Will Happen To Taxes If the GOP Wins? As the old saying goes, there are only two things certain in life: death and taxes. While being taxed is a certainty, the rate and types of income being taxed is not. Each of the five remaining GOP hopefuls – Donald Trump, Ted Cruz, Marco Rubio, John Kasich and Ben Carson (who appeared on the verge of dropping out as this article was written) – has released tax proposals on his official website. Examining these plans provides a rough idea of what will happen to the tax system if a GOP candidate wins the November presidential election. Since few voters or politicians are currently discussing the taxes to support programs like Social Security, Medicare (payroll taxes), fix the nation’s highways (gasoline taxes) or curb public health problems (“sin” taxes on cigarettes and alcohol), my analysis will adhere to the candidates’ laser-like focus on income and business taxes. Currently, the federal government has seven tax brackets for individuals. All five of the GOP candidates want to reduce the number of tax brackets. Brackets are designed to make the tax system progressive so that richer people pay a higher percent of their income in taxes than poorer people. 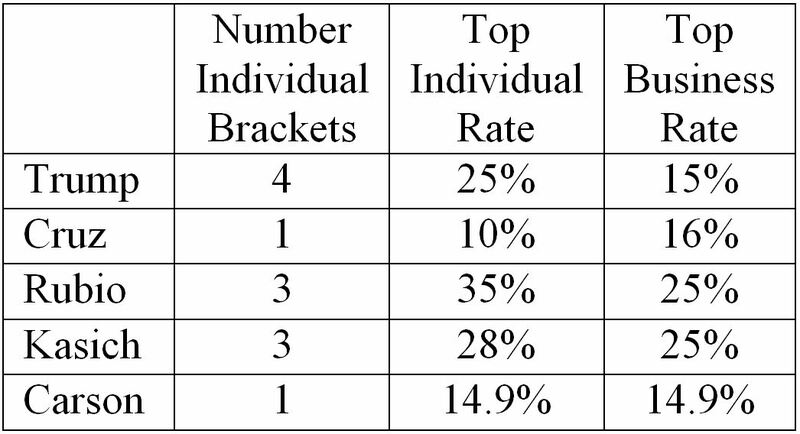 Reducing the number of brackets simplifies the tax system but also reduces progressivity, leading to a system where the rich and poor people pay similar percentages. The debate over whether it is fair for the rich and poor to pay similar percentages has a very long history. This question was brought up by the earliest economists like Adam Smith and John Stuart Mill. The subjects of every state ought to contribute to the support of the government as nearly as possible in proportion to their respective abilities. While most people today agree that the rich should pay more (in absolute terms) than the poor, there are numerous arguments as to whether they should or should not pay proportionally more. Today’s GOP candidates approach Mill’s proposal very differently. Trump supports the most progressivity by proposing the current system be scaled back from seven brackets to four. Rubio and Kasich both support three brackets. Cruz and Carson are on the other end entirely, with both supporting a single bracket flat tax, which has no progressivity. Another element of progressivity is what’s the top rate. At the moment, the federal government has individual tax rates ranging from 10 percent to 39.6 percent, with each bracket applied to different levels of income. For example, today the top rate doesn’t kick in until income levels reach over US$410,000 for singles and over $460,000 for married couples filing jointly. All five GOP candidates want to lower the top rate. A high tax rate means the wealthy provide billions to the government in revenue, at least temporarily. However, an effective tax system should affect economic decisions as little as possible. High rates often provide a disincentive to work and invest. This means that high rates potentially can kill the golden goose of high government revenue. If high rates cause people to work less, than there will be less income for the government to tax. While all five candidates want the top rate figure to fall, their proposals vary widely. Rubio wants to lower the top rate the least by proposing a ceiling of 35 percent. Cruz with his flat tax proposes cutting the top rate the most by taxing everyone just 10 percent, no matter what they earn. Trump (top rate 25 percent), Kasich (28 percent) and Carson (14.9 percent) all feel the optimal number for high income earners is a figure somewhere between Rubio’s and Cruz’s values. Corporate tax reform has been a big issue in recent years and one that increasingly has received some degree of bipartisan support. Both Republicans and Democrats have argued the top business tax rate of 39 percent is too high. Business taxes can be controversial because some people view them as unfair. For example, if you are self-employed, the money earned doing that job is taxed just once at the individual rate. However, if you incorporate the business and do the same work, the money is taxed twice, once at the corporate level and a second time when the business gives the profits to the individual. Another problem is that many large corporations have some leeway in which countries they book profits. While some transactions are clearly local, it is difficult to determine where some transactions actually occur. For example, if a person living in the U.S. buys a song from an Irish band over the Internet from a computer server located in Canada, which country has the right to tax the transaction? These jurisdictional issues mean companies try to book profits in a country with the lowest tax rate. Currently, many corporations favor Ireland because in 1987 the country slashed the maximum corporate tax rate to 12.5 percent. This dramatic drop resulted in many multinational businesses moving their European operations to this low-tax haven. All five candidates want the top business tax rate to fall, but in a variety of ways. Rubio and Kasich both want to lower the top rate the least by proposing a new top rate of 25 percent. The other three, however, prefer to slash it much more, seeing the optimal top rate closer to 15 percent. Specifically, Carson targets 14.9 percent, Trump 15 percent and Cruz 16 percent. Still, no candidate proposes a maximum rate that would undercut Ireland. No matter who wins the GOP nomination this summer, it is relatively simple to predict the type of tax legislation that will be pushed by a Republican president in 2017: fewer brackets and lower maximum tax rates. The reduction in brackets would most likely lead to a less progressive tax system, but it’s less certain how each plan would affect tax revenue and U.S. gross domestic product (GDP). All five claim that their proposals would dramatically boost economic growth. For example, Cruz believes his proposal would boost GDP by 13.9 percent over the next decade – or an average of about 1.4 percent a year – while Carson assures us GDP will be 16 percent higher if his flat tax plan is enacted. Many of the candidates claim this greater growth will offset any reduction in revenue because of the lower rates. Will these predictions of accelerated economic growth prove accurate and result in overflowing tax coffers? Or will these reductions in rates lead to a fiscal crisis? There are too many unknowns to accurately predict the result. This leaves us with the cold comfort that death is now the only thing with true certainty. Posted by Jay Zagorsky at 8:57am March 3, 2016 Posted in Macroeconomics and tagged double taxation, flat tax, progressivity, Republican, tax, Tax plan, taxes, Trump. Bookmark the permalink. ← Is It Time to End Tipping?